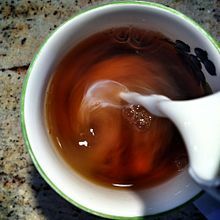 Milk tea refers to several forms of beverage found in many cultures, containing some combination of tea and milk. Beverages vary based on the amount of each of these key ingredients, the method of preparation, and the inclusion of other ingredients (varying from sugar or honey to salt or cardamom). Instant milk tea powder is a mass-produced product. This page was last edited on 4 March 2019, at 02:32.